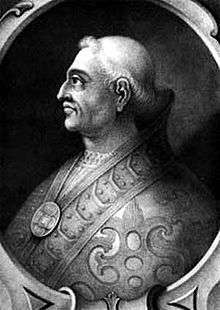 Pope Severinus (died 2 August 640) was Pope two months, from 28 May until his death on 2 Aug. He became caught up in a power struggle with the Byzantine Emperor Heraclius over the ongoing Monothelite controversy. He was a Roman. His father was named Avienus, according to the Liber Pontificalis. The name of the father suggests descent from members of the Roman Senate. A previous Avienus was Roman consul in 501. Severinus was elected on the third day after the death of his predecessor, Honorius I, and the Papal apocrisiarii went to Constantinople to obtain imperial confirmation of his election in October 638. But Emperor Heraclius refused to grant his confirmation unless Severinus signed his Ecthesis, a Monothelite profession of faith. The envoys were unwilling to agree to this demand, but they were also unwilling to allow the Roman See to remain vacant indefinitely, so they offered to show Severinus the document and ask him to sign it if he thought it was correct. This offer was apparently satisfactory, and imperial recognition of the papal election was granted. Before his death, however, Patriarch Sergius I of Constantinople had drawn up the Ecthesis in response to the orthodox synodical letter of Sophronius, the Patriarch of Jerusalem, and on learning of the death of Pope Honorius had convinced the Emperor to issue this document as an imperial edict in December 638, thus valid across the entire empire. Given directly to Eustachius, the magister militum, he carried it to the Exarch Isaac at Ravenna with instructions that he was to ensure the Pope’s acceptance. With its declaration of Jesus Christ only possessing one will, Severinus refused to sign it. The exarch therefore refused to confirm the papal election in the Emperor’s name, a situation that endured for over eighteen months. In the meantime, Isaac was determined to achieve his aim, so he commissioned Maurice, the chartoularios, to plunder the Lateran palace and force Severinus to agree to the Ecthesis. Maurice gathered together a party of local discontented nobles and approached the local soldiers, the exercitus Romanus, and convinced them that the Pope had withheld their pay and was keeping the arrears in the Lateran. A mob soon formed and they rushed en masse to the palace. Severinus managed to keep the hostile forces out of the palace. Maurice tried another tactic and three days later he was admitted into the palace with the city judges whom he won over to his side. They sealed up the treasures, and Maurice sent word to the Exarch that he was free to come to the palace and help himself to the accumulated riches. Isaac soon appeared, and after exiling the leading clergy within the Lateran, spent the next eight days looting the palace, prudently sending a share to the Emperor at Constantinople to prevent his displeasure. Meanwhile, at Constantinople, the papal envoys had continued to seek the confirmation of Severinus. At first they were clearly told that unless they would go back and persuade the Pope to accept the Ecthesis, they were wasting their time. To get around this obstacle, the legates sought to persuade an unwell and slowly dying Heraclius that they were not there to make professions of faith, but to transact business. They did say they were quite willing to put the document before the Pope, and if he liked what he saw, they would ask him to sign it. But they made it clear that if the emperor was going to force Severinus to sign it, that all the clergy of the See of Rome would stand together, and such a route would only end in a lengthy and destructive stalemate. Over the following year the legates stood firm, and at last a clearly tired Heraclius backed down, broken by opposition both at Constantinople and at Rome against his Monothelite compromise. The emperor granted the envoys their request, and the legates returned to Rome with the news, and Severinus was finally installed as pope on 28 May 640. Isaac quickly withdrew to Ravenna. During the short time he was pope, Severinus condemned the Ecthesis. Convening a synod, he decreed that “as there were two natures in Christ, so there were two natural operations.” He also renewed the mosaics in the apse of Saint Peter’s Basilica. Unfortunately Severinus was already quite old when his election was confirmed, and his reign was only two months long when he died on 2 August 640. In the Liber Pontificalis, Severinus was described as a kind, generous and mild holy man, a benefactor to the clergy, and a friend to the poor. ↑ Herbermann, Charles, ed. (1913). "Pope Severinus". Catholic Encyclopedia. New York: Robert Appleton Company. Herbermann, Charles, ed. (1913). "Pope Severinus". Catholic Encyclopedia. New York: Robert Appleton Company. Maxwell-Stuart, P. G. Chronicle of the Popes: The Reign-by-Reign Record of the Papacy from St. Peter to the Present, Thames & Hudson, 2002, p. 57. ISBN 0-500-01798-0.